Ohhhh LAAAA LAAAA!!! Today's rustic Country Home Milk Can creation comes from my talented teammate Estie Joubert. Are you drooling over the background? Estie embossed her Basic Black Cardstock layer with the Tin Tile Dynamic Textured Impressions Embossing Folder (which we all know is my favorite embossing folder) but she cranked it UPPPPP by sponging the Bright Copper Shimmer Paint randomly over the design. I'm telling you these pictures do not do this card justice as this technique is a thing of beauty and so simple to boot. 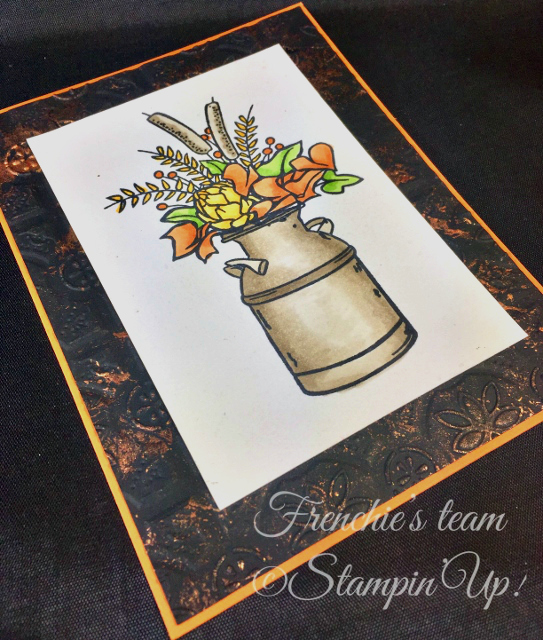 She then stamped the milk can and the cattail arrangment on Thick Whisper White Cardstock and colored them using her Stampin' Blends Markers. 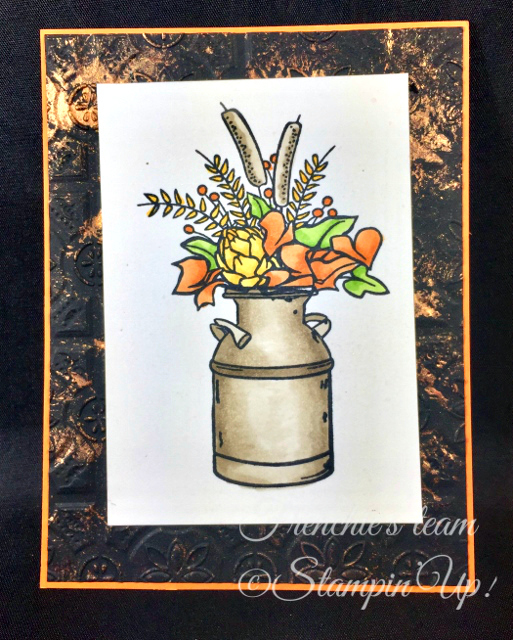 Add any sentiment you would like to the milk can with it's sign stamp and various sentiments or leave it as is like above for the perfect fall card. I hope Estie got your creative juices flowing today, as I know she has mine. Card Base - Pumpkin Pie - 8 1/2" x 5 1/2" scored at 4 1/4"
Second Layer - Thick Whisper White - 5" x 3 3/4"